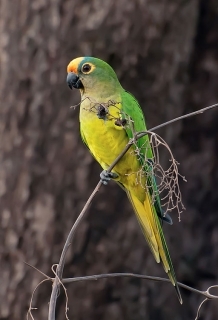 The Peach-fronted Conure is possibly increasing in population in some areas due to agricultural expansion. E.a. aurea: Both adults yellow/orange forehead and forecrown; back of crown and occiput to lores dull blue; light olive throat, cheeks and breast. Bill grey/black. Eye-ring orange, eye orange/yellow. E.a. major: Both adults as in aurea but green slightly darker; frontal patch paler in colour; larger in size. As in adults but with narrower frontal patch. Bare eye ring pale grey in colour, eye grey. Shrill screeching notes while in flight. One of the most popular in recent years, but limited breeding. Fruit such as: apple, pear, orange, cactus fruits, pomegranate; forming about 30 percent of the diet; vegetables such as: carrot, celery, green peas and beans; corn on the cob, green leaves; spray millet, small seed mix (canary, millet, oats, buckwheat, safflower and limited sunflower); soaked and sprouted sunflower; cooked beans or pulses, and complete kibble. Bathing, foot toys, ladders, swings, bird-safe wood chewables such as fir, willow, pine or elder branches, bird-safe vegetable tanned leather chewables, heat sterilized pine cones. Vertical box, 12" x 12" x 18" (30.5cm x 30.5cm x 45.7cm). Heavily trapped (61,311 individuals recorded in international trade since 1981). E.a. aurea: S Surinam, N Brazil, and south of Amazon River from NE and inland Brazil to E Bolivia, SE Peru and NW Argentina. E.a. major: Exact range not known, but recorded from N Paraguay. Occurs in open woodland areas including deciduous forest, gallery woodland, Mauritia palm swamp and savanna as well as cultivated areas. In Amazon River area occurs in low scrubby vegetation on sandy soil; in interior E Brazil occupies caatinga and cerrado areas with grassland. Below 600m (1968 ft). Eats seeds, flowers and insects including termites and larvae of beetles, flies and moths. Found in pairs during breeding season otherwise in groups of 10-30 birds; feeds in trees and on ground often in company of other parrot species. Tame and approachable. Roosts communally. 2 to 6 rounded eggs, 27.5 x 22.0mm (1.1 x 0.8 in). June-July, Peru; January, Mato Grosso.